Following comments from CEO Tim Cook on Wednesday, Apple on Thursday confirmed it will not hold a public auction to decide the site of a new U.S. campus that will be built in part using money repatriated from the company's overseas cash hoard. In a statement to Reuters, an Apple representative confirmed the company does not plan to hold a public bidding process for the planned campus, which will initially be populated by AppleCare workers. The announcement echoes statements Cook made in an ABC News interview on Wednesday, where the Apple chief said he does not want "an auction kind of process" to decide the location of the upcoming campus. "We've narrowed the list a lot," Cook said of candidate sites. "We wanted to narrow it so we prevent this auction kind of process that we want to stay out of." With millions or billions of dollars in investment capital on the line, a number of U.S. cities are throwing their hat into the ring. According to the report, Chicago Mayor Rahm Emanuel is among those pushing to be in Apple's good graces. "We're going to go compete and were going to put our best foot forward," Emanuel said. Apple revealed plans to build a new U.S. campus on Wednesday as part of a huge $350 billion infusion into the U.S. economy. The company remains mum on the exact size of the facility, and has deferred comment on a final location to later this year. As noted by the report, Apple's non-bid strategy runs counter to another high-profile campus project currently underway at Amazon. The online retail giant is accepting bids for a $5 billion headquarters dubbed "HQ2," which will house up to 50,000 employees. On Thursday, Amazon said it had narrowed down the list of candidate locations to 20 cities, 19 in the U.S. and Toronto. 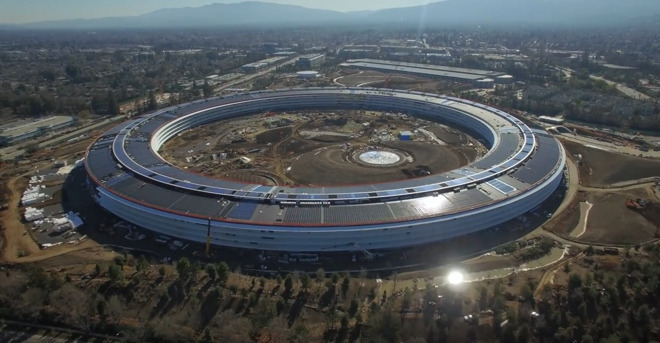 Alongside the planned campus, Apple is earmarking $10 billion for data center expansions, $4 billion for its Advanced Manufacturing Fund and an undisclosed amount for educational initiatives. The influx of cash is expected to generate some 20,000 jobs and pump $38 billion in taxes into federal government coffers.